The redwoods are the world's tallest trees, and many of the highest ones reside in the Redwoods National Park in northern California. Some are 30-stories high and have lived for 2,000 years. 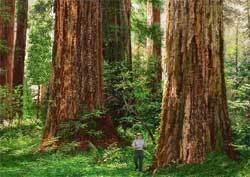 The redwood bark is extra thick, which helps protect the plant during forest fires. The bark is also high in tannin, which insects hate. And, the tree self-sheds all but the branches high off the ground, which also thwarts insect attack. All these factors contribute to the organism's remarkable multi-millennial longevity. The bark is more auburn than red, but inside, the color becomes redder. This gives the tree its name. The roots are unexpectedly shallow for such a towering life form. They rarely go deeper than 3 meters (10 feet). Instead, they broadly spread out. And, they tangle with the roots of other redwoods, which creates structural reinforcement. The need to do this is one reason why redwoods grow close together.